There have been a number of news worthy hackings over the past few months (Yahoo being the latest BIG one), and the one thing you hear every one say after each site gets hacked is “You shouldn’t use the same password on multiple sites”. That however is easier said than done, considering how many passwords we have for work, school, email, banking, social media, etc.…..there is no way that you will be able to remember all of them. We have so many things we dthese days, which is one of the main reasons most people repeat or use simple passwords over and over. 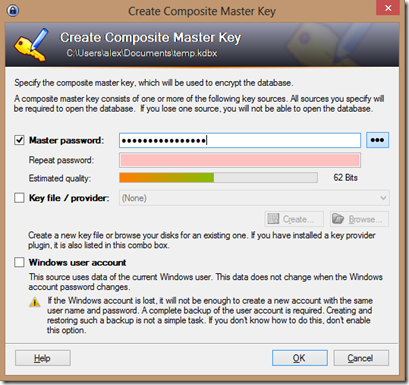 This short tutorial will show you the basic usage of the KeePass password manager. If you are downloading KeePass from the Ninite website, all you need to do is put a check next to the program and then click the Green “Get Installer” button on the Ninite page. The reason we prefer Ninite is that they will install it without any extra unnecessary files or toolbars that you could end up with if you get the program from other sites. The very first step is creating a new password database. KeePass will store all your passwords in such a database. To create one, click ‘File – New…’ in the main menu or click the leftmost toolbar button. A window will appear, which prompts you for a master password and/or key file. The database will be encrypted with the password you enter here.The password you enter here will be the only password you’ll ever have to remember from on now. It should be long and built up of mixed characters. Keep in mind that when someone gets your database file and guesses the password, he could access all passwords you stored in the database. For this tutorial, we’ll just use a password, not a key file. Click into the password edit field and enter a password of your choice. The password edit control isn’t limited in length, so feel free to even enter a whole sentence (just keep in mind that you’ll need to remember it). After clicking [OK], a second dialog appears. 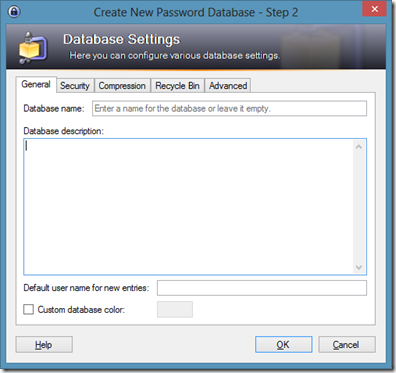 In this dialog you can configure some generic database properties. For now, just leave everything as it is and click [OK]. Now you see the main window. On the left, you see the entry groups. On the right, you see the actual password entries. The password entries are grouped together into the password groups you see on the left. So, depending on which group on the left you selected, it’ll show you the entries in this group in the right view. KeePass has created a few default groups for you, but you’re totally free to delete them and create your own ones. Enter some title for it, an username, an URL, the actual password, etc. If you don’t need some of the fields, just leave them empty. When you’re done, click [OK]. You’ll see your new entry in the password list on the right now. You got the new entry in the password list now. What can you actually do with it now? Right-click onto the entry. You have several options now. 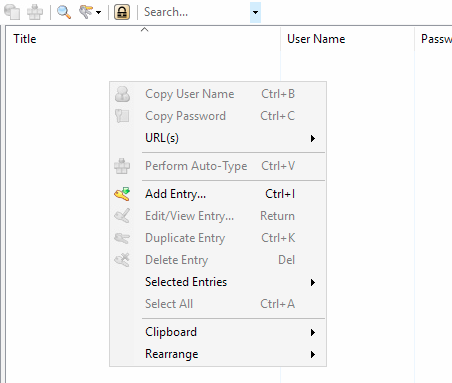 You can for example copy the username of the entry to the Windows clipboard. When you’ve copied it, you can post it into any other program of your choice. The same works for copying passwords. KeePass can open the URL you specified. 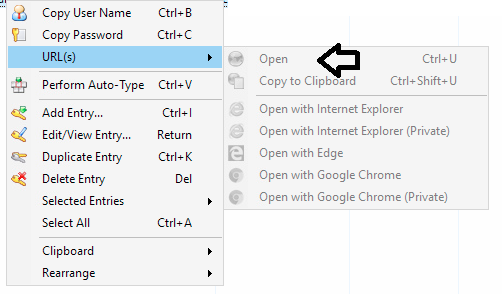 To do this, just click ‘URL(s) – Open URL(s)’ in the context menu. 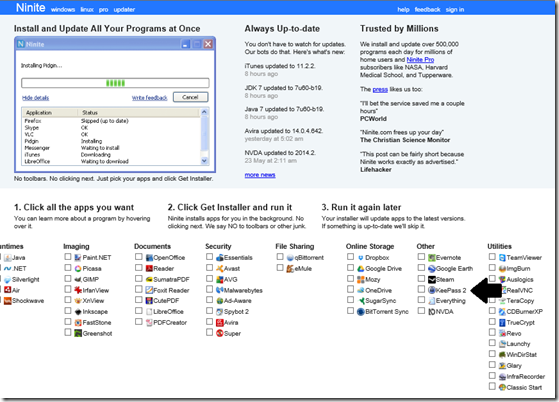 KeePass will start the default browser and open the specified URL. It’s time to save our database. Click onto the ‘Save’ toolbar button (looks like a disk; 3rd toolbar button). As you’re saving the database the first time, you now have to specify a location where you want the database file to be stored. There are a number of free password managers, KeePass is just one of the more well-known. Programs like KeePass are free and will help you keep track of all your passwords. There is no reason why you should be using simple passwords (like password or 12345) and no reason why you are using the same password on all your sites. There is an old saying about having “all your eggs in one basket”, well using the same password on your accounts is the digital equivalent of that. 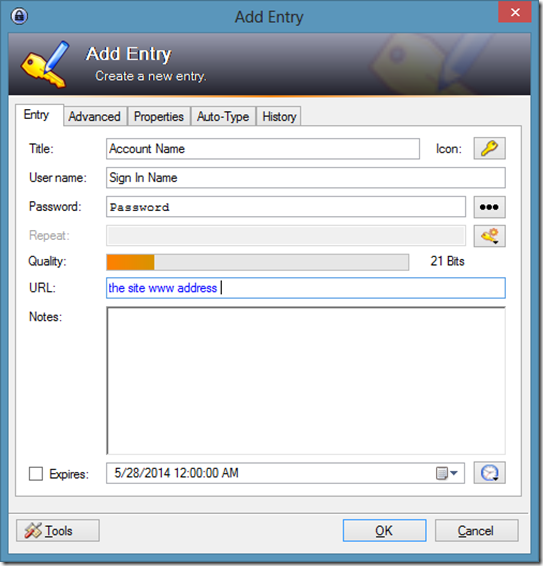 KeePass is available for Windows, Mac, Linux, iOS (iPhone / iPad), Android, and Blackberry.